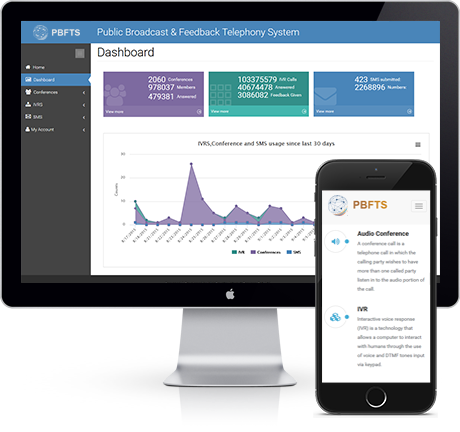 Obtain feedback from public/employees on various schemes via phone calls. The receiver will either press keys or record his feedback. Telephone based group dial-out call, with easy-to-use dashboard for operator to control the tele conference. Send Text notifications/alerts on mobile phones like meeting requests, scheme details, Holiday alerts etc to designated teams. The Government of Andhra Pradesh, intended to ensure that all the information related to Government Services & welfare Schemes being implemented for the public must be pooled in a single system and create awareness in the public using telephonic- Voice & SMS campaigns. Moderator can schedule a tele conference by choosing participants and selecting a date and time to hold the tele conference call. Add and organize your contacts into unlimited groups by using a simple excel tool. Upload SMS content and broadcast in seconds, to as many people as you want. PBTS or Public Broadcast & Feedback Telephony System is an automated telephony system that integrates Bulk Broadcasting of SMS and Voice Calls, Integrated Voice Response (IVR) and Audio Conferencing Services to effectively monitor implementation of government services and schemes, gather feedback from the citizens on government performance and communicate en masse with all government officials. It is a Telecom Application which stores large pre-recorded message that supplies information as required or desired by any organization. It can also take input from caller/user in terms of DTMF, Voice Command. IVR has much application and is used almost in all industries. Is it a PC Based Application? Does it use any special hardware? Yes, it is a PC based Application. Normally Server Class PCs are used as it has to operate round the clock. It uses special hardware call CTI boards, commonly known as CTI Cards. When a caller dials the IVR number, the CTI card handles the telecom signaling, call connection part. IVR Application receives the call, play WAV files, detect DTMF digits or speech recognition, retrieves information as per the DTMF or Speech Command and play the required wav files as per the information. Can it replace a Telephone Operator? My Answer is YES. It can actually replace a telephone operator and it can do much more than that. But using IVR may not be easy for first time users as well as people used to Telephone Operators. So it is recommended that the designing of menu for the IVRS. Are different kinds of IVR Systems? Inbound IVR : Users call the IVR number, so it is called inbound IVR. Outbound IVR: IVR calls out to the users, so it is call outbound IVR. On Premise IVR: IVR system which is installed on the premise to be used exclusively by the company. It was only kind of IV before. Hosted IVR: With advent of web based applications as well as internet penetration, it is now possible to host IVR system at remotely. So it is called hosted IVR system. Hosted IVR or IVR Hosting service where user can design, deploy their own IVR or Telephony Applications themselves is Cloud Telephony! It main benefits include developing Telephony applications using high level languages, fast development, no initial investment and pay per usage! What is Bulk Voice Call? Bulk Voice Calling is broadcasting of pre-recorded voice message to many telephone numbers simultaneously or sequentially. It is the voice version of text SMS (Short Message Service) broadcasting which is widely used across various industries. The only difference between a bulk voice call and IVR is that you cannot collect any feedback from the caller using bulk voice call. It is mainly used to broadcast a voice message to the users. Bulk Voice Call is also known as Call Blast, Voice Broadcasting, Automated Voice Campaigns, Voice SMS, OBD (Outbound Dial), etc. . Yes you can schedule calls on both mobile and landline numbers. Please make sure that the number entered is a ten digit number For example: Mobile Number should be entered without 0 or 91 (9711520500) Land line numbers should be entered with the STD code omitting 0 (4046208080). Can I listen to the message again by pressing 1? Yes, we support DTMF Key Presses (Dual tone multi frequency). We also allow you to make an IVR which loops on a Key Press. This can be achieved through IVR Studio. Sending SMS in large mobile numbers by using platform to reach out potential customers . It is mainly used byorganization and business unit to send notification or information to group members. one-time password (OTP) is an automatically generated numeric or alphanumeric string of characters that authenticates the user for a single transaction or session. Once you received OTP to the desired mobile number,please enter the OTP in the desired text box.This is purely for security purpose. It is a telephony application that allows multiple phone users to be connected to a single phone call. What types of Tele Conference are available? Dial-Out Conference: The bridge number dials out to all participants and connects them to a single call. Dial-In Conference: Participants can dial the bridge number and are connected to a single call. Operator Assisted Conference: For large conferences (50 or more participants) an operator will assist the moderator to control the conference. What is a Bridge Number? A bridge number or virtual number is a land-line or mobile number that is hosted in the cloud. Users can call the bridge number or the bridge number can call the users to join them on a single call. Moderator is a person who is important to the conference. He has access to all the features and can monitor all aspects of the call. Participants are all the people on the conference call other than the moderator. What is the Mute/Un-mute Feature? Using the Mute/Un-mute feature a moderator/operator can control which participants can talk during the conference. What is the Hand-Raise Feature? Participants who are on mute can use the keys on their phone's keypad to alert the moderator/operator that they want to speak. The moderator gets an alert on the Conference Panel and can take necessary action. What is a Tele Conference Panel? The Moderator/Operator has access to a web based panel that allows them to monitor and control the Tele conference. The can Mute/Un-mute participants, see the total participants, add more participants to the Tele conference etc. Designed & Developed by WebCountry Internet Services Pvt. Ltd.